← Hurry! Force Link 2.0 "Solo" TIE Fighter Only $20 And Change! 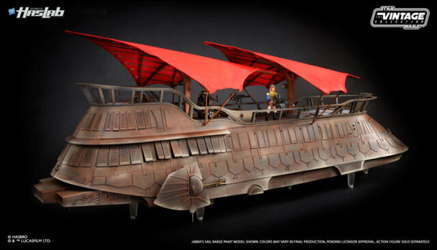 A Little Hope For International Collectors Who Want Jabba's Sail Barge? JTA reader George S. contacted Hasbro’s customer service about the impending “international release” of Jabba’s Sail Barge. And hopefully, it will comfort international collectors desperate to obtain this vehicle in their collections. It’s exclusionary to the people who already had a chance to grab them. Find out more by clicking through. As promised, we are delivering JABBA’S SAIL BARGE beyond US and Canada for international consumers in Australia, Austria, Belgium, France, Germany, Hong Kong, Italy, Mexico, Netherlands, New Zealand, Portugal, Spain, and the UK. Limited quantities will be available on eBay in March. At this time we do not have a specific date available, but our international consumers can keep a lookout for more information to be announced. We apologize, the above offer will not include the US and we do not have information at this time that any more Sail Barges will be available in the future for our US consumers. Previous Article: Hurry! Force Link 2.0 "Solo" TIE Fighter Only $20 And Change!